Jessica Snow is an artist, educator, and curator based in San Francisco. Her painting is characterized by bright, playful geometrics, and her inspiration is fed by research into mid-century architecture, landscape design, 20thc. art history and Asian art history. Two recent research trips to Suzhou to study Classical Chinese gardens, calligraphy and ink-wash painting informed her previous body of work, presented at Galleri Urbane in a solo show entitled 'Master of the Nets'. Currently Jessica is preparing for 'Badass Color', a 2-person show at Le Pavé d'Orsay in Paris. 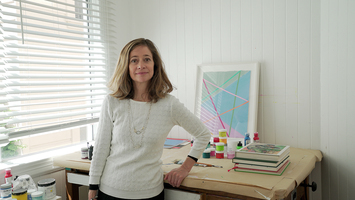 For this show, scheduled for June 2019, she and fellow California artist Anya Spielman are turning their attention to the uniqueness of their California locale, looking at how the color, light and landscape of their home state informs their work. Jessica has had several solo shows in the Bay Area, New York, and Southern California, including the Riverside Art Museum. She’s been in group shows at the Indianapolis Museum of Contemporary Art, Crocker Art Museum, Monterey Art Museum and the Sonoma Valley Museum of Art. Internationally Jessica has participated in many group shows in the Netherlands, Germany, France, Thailand, Australia, Uruguay, Argentina, and Ukraine. Jessica earned a BA from UC Davis and a MFA from Mills College, and also attended the Sorbonne and Skowhegan School of Painting and Sculpture. She is adjunct professor in the Studio Art and Art History departments at University of San Francisco, and she’s the recipient of the Cadogan Fellowship Award, the Artadia Award in the Visual Arts Grant, and the US State Department's American Artists Abroad Program.